Thank you to all of the pirates that joined us on Thursday Night for our Unlock the Treasures of Reading Night! Our students loved hearing the stories, getting beads and eating cookies! Also, thank you to the parents that attended our PTA General Meeting at the flagpole. As part of the meeting, we reviewed and approved funding for a new project. Our goal over the past year and a half has been to upgrade our technology. With the funds raised last year, we were able to purchase 1 computer cart (with at least 20 laptops) for each grade level for a total of 120 laptops. The idea of the laptop cart is to make it easier for our school to deliver the newest technology to our students. The laptop cart will allow the computers to go from classroom to classroom, so that the computers can be utilized by more students during a single school day. For the 2018-19 school year, we included budget items for additional technology upgrades. We have already approved the purchase of 2 ceiling mounted projectors, 2 iPads, and 1 laptop and plan to purchase additional technology for the media center. Principal Dosal requested that we use the our additional funds this year to install a new digital marquee. The digital marquee will assist the office in quickly communicating with our parents and providing up-to-date reminders of important events at Grady, instead of monthly updates. During the meeting, we officially voted to fund the digital marquee with our additional funds. We will share more information about the marquee as it becomes available. In addition, during the meeting we approved over $2,500 in mini grant requests from our teachers and specialists that include: purchasing 100 classic literature books for 4th graders, providing flexible seating options for students, approving subscriptions (News 2 You, Scholastic, Storyworks, Starfall and ABC Mouse) that benefit students in multiple grades, and providing our ASD classrooms with kits that help with fine motor skills and help with science experiments. Thanks to all of our amazing sponsors, donors during events such as Tiger Trek and Auction Night, and increased club enrollment, we have acquired more funds that allow us to better serve our students and the community. Kindergarten Countdown is coming up on January 25th from 8:15 - 9:15 am. This important event is for parents of children that will be starting Kindergarten in Fall 2019. The incoming students can attend with their parents. 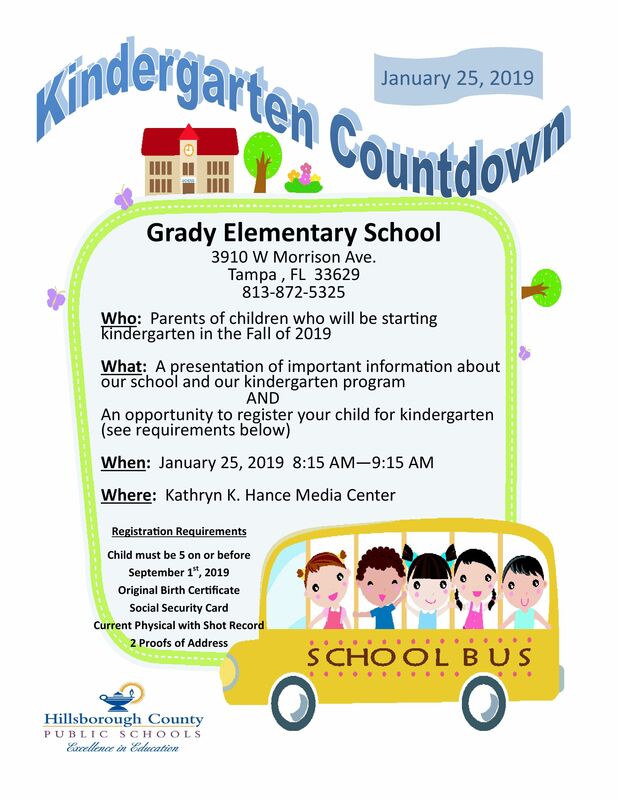 Please click on Kindergarten Countdown for more information and please share with any families that may be starting Kindergarten at Grady this Fall. Don't miss our Grady PTA Family Skate Night at United Skates of America on Thursday, January 31st from 6:00 - 8:00 pm (admission begins at 5:30 pm with pre-sale tickets) with the World's Largest Indoor Snowball Fight. For more details, click on Family Skate Night. Pre-sale tickets are available until Tuesday, January 29th. Tickets are only $6 per person and include regular skate rental. Non-skating adults are free. Click on Skate Night Tickets to purchase. The following students raised at least $150 for Tiger Trek and earned 2 tickets to the Family Skate Night in January: Derek Johnson, Sydnee Moniz, Angus Tutterow, Andrew Valle, Michael Neward, Kaila Ledford, Ethan Ledford, Hayden Atzenhoefer, Dylan Pham, Zoe Beauregard, and Leo Bernedo Lores. There will be 2 wristbands at the entry door for each of those students starting at 5:30 pm. Join us for our totally rad 80's themed auction on Saturday, March 9th. This adult only event will be held at Christ the King from 6:00 - 10:00 pm. Early Bird Tickets are now available for $35 per person through Sunday, March 3rd. The ticket includes admission, dinner and 2 drink tickets. To purchase your tickets, click on Grady Auction Tickets. Hang your college flag in front of Grady for a year. Grab your friends and be sure to win this highly coveted item! Which college will be waving its flag this coming year? We are still looking for donation items for the auction. If you have an item to donate, please contact Jaime Patterson, [email protected]. Yearbook sales are open online! Prices are currently $20 for a softcover yearbook and $25 for a hardcover yearbook, however, pricing will increase April 1st. Please visit www.strawbridge.net to purchase online and enter online code 112045. What is Crayola ColorCycle? Crayola’s latest sustainability initiative designed to repurpose markers, highlighters and dry erase markers. All marker brands are accepted. How do I help? Collect markers and drop them off in the front office or your student can give them to our art teacher, Debonique Grigsby. For more information, click on ColorCycle.